The best way to successfully bring projects to a close is to take care of matters yourself and make sure that everything is running smoothly. The fact that GLAUB’s business activities outside of Germany are experiencing particularly successful growth has meant that some of our staff have been travelling a lot in recent months:America: A team of five GLAUB employees visited facilities in America between August and mid-September. The team, which consisted of three installers and two programmers from Germany and Hungary, travelled to America in order to install not one, but three extensive systems for the final inspection and testing of electronic component assemblies that had been shipped over from Germany and to put these systems into operation.South Korea: In August, two programmers from our Process Technology department and a project manager from our Control Technology department travelled to South Korea in order to put several production systems into operation and secure the run-up phase.China: In October, one of our installers travelled to China in order to deliver a new test system for battery cells and systems to an end customer together with our client. The installer also helped the engineer responsible for the project in question to put the system into operation. Alongside our activities abroad, we are also extremely active in Germany. 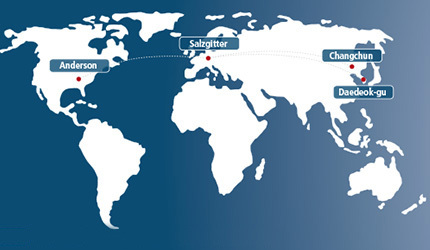 At present, for example, a number of installation teams containing two to four GLAUB installers are working on a wide variety of different system installations and relocation activities involving extruders and compounders, some of which require several weeks and months of work.